Live-radio in “Het Zondagochtend Concert” presented by Hans van den Boom, radio 4 . Henk van Twillert was invited by pianist Frans van Tuijl to play a special concert at his residence to celebrate spring time in Waalre. ​Henk van Twillert is proud to be performing "Fellini" from Johan de Meij's with The Duke University Wind Symphony, directed by Verena Mösenbichler-Bryant. ​BACH MEETS HÄNDELHenk on his beloved baritone saxophone invite the the Syréne saxophone quartet for a very a very special meeting: "Bach meets Händel”. 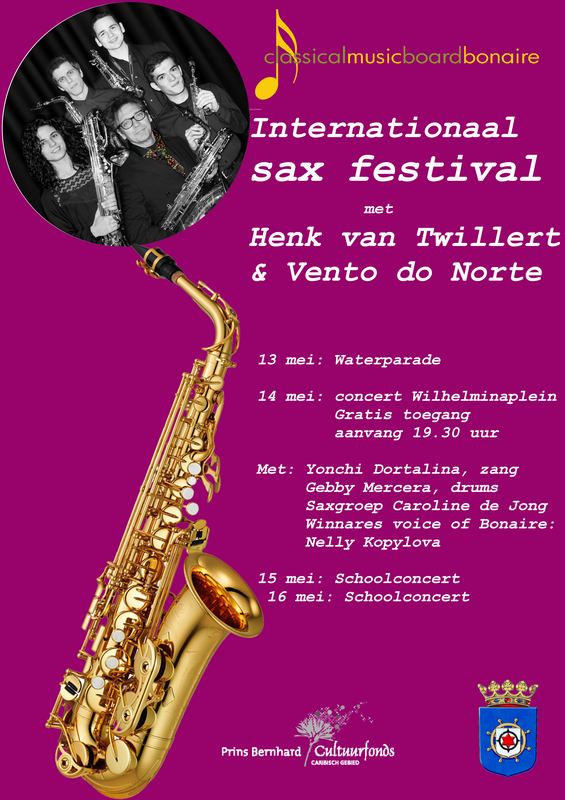 ​On the 17th and 18th December Henk van Twillert will be given a saxofone masterclass on the music school AMVP in Vila Nova de Gaia, Portugal. 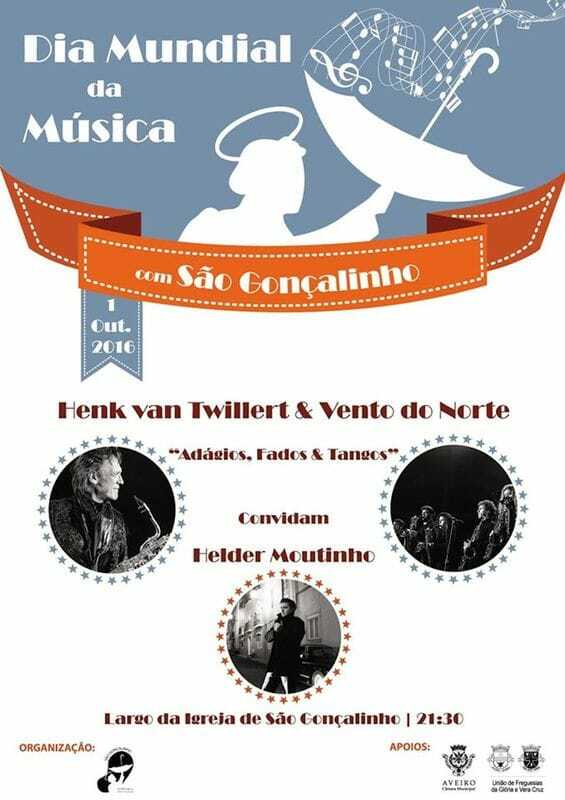 Henk van Twillert & Vento do Norte will be playing a concert open to all community. 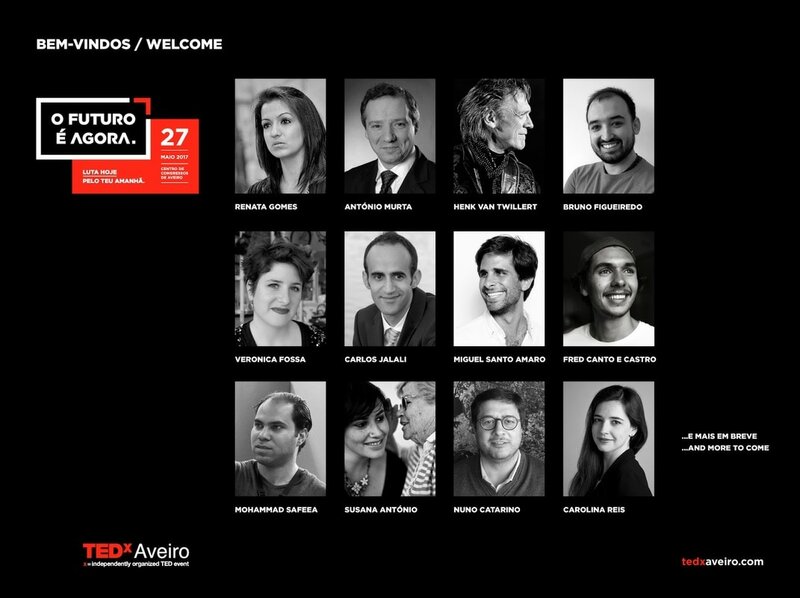 João Figueiredo and Inês Soares will join them for special moments. This challenge consisted in creating a circuit / itinerary of intimist mini-concerts to be held in several houses of the Beira-Mar´s Quarter, where the population will open their doors to receive not only the invited musicians, who will carry out small performances of various genres and musical styles, but also the guests who will be present at the musical pieces, organized in small groups and accompanied by an element of the Mordomia de São Gonçalinho. These mini-concerts are the highlight of the first of the three days festival, and will take place from 9:00 p.m. until 0:00 a.m. on Friday, September 21st. 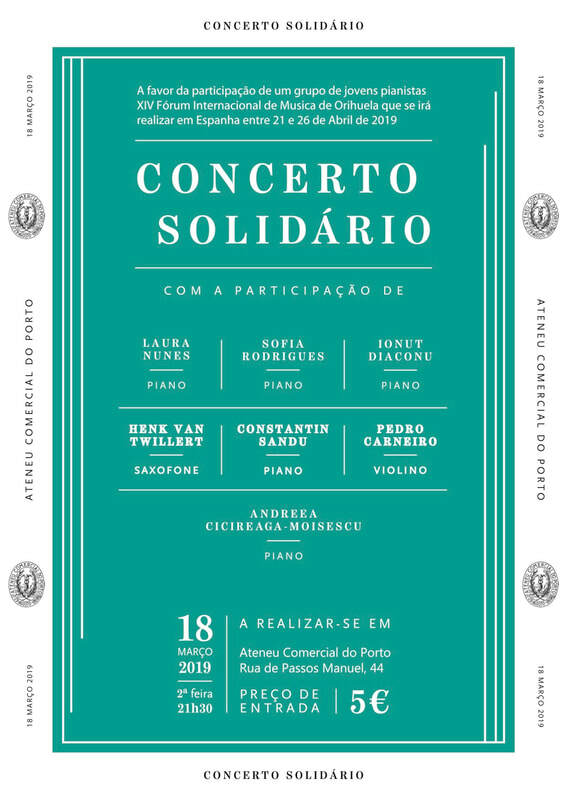 For this day, 18 stages and 18 artists are confirmed, who will gather at Largo da Capela de São Gonçalinho later in the evening, around 0:00 a.m. to celebrate the moment and sing the great Marcha de São Gonçalinho with the population and spectators. 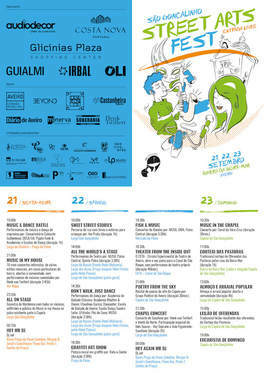 The São Gonçalinho Street Arts Fest is an urban festival of performative street arts conceived by Mordomia de São Gonçalinho and will take place the 21st, 22nd and 23rd of September 2018 in the Beira-Mar Quarter, in Aveiro. This festival intends to become a mega event offering street animation and social interaction among the people of the neighbourhood, the city and visitors / tourists, creating a unique event, never before seen in the city of Aveiro, highlighting the collective participation of more than a hundred people and entities that made it possible, creating a joint work totally offered to the city, and by which the organization is very grateful. 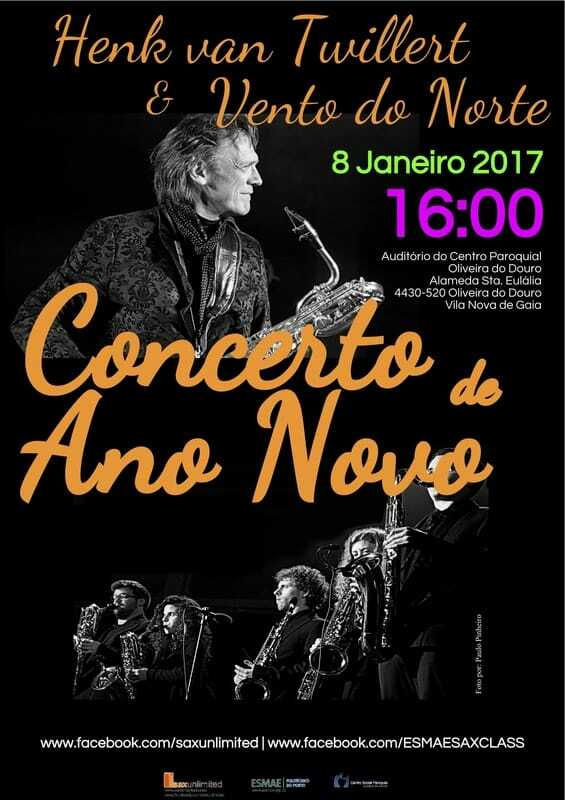 Special participation of Orquestra Portuguesa de Saxofones conducted by Cláudio Pereira. 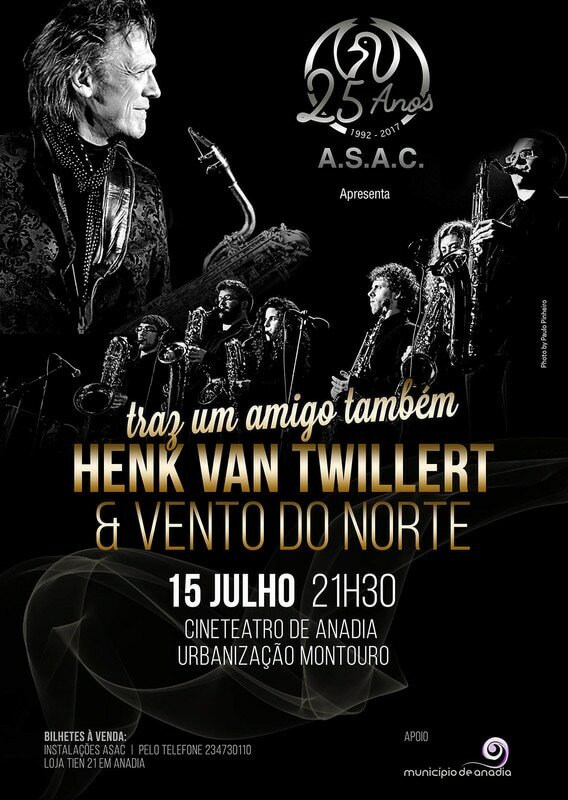 Henk van Twillert in Concert - “Saudades"
The closing of the 'Henk van Twillert in Concert' series is dedicated to the Portuguese National Day. 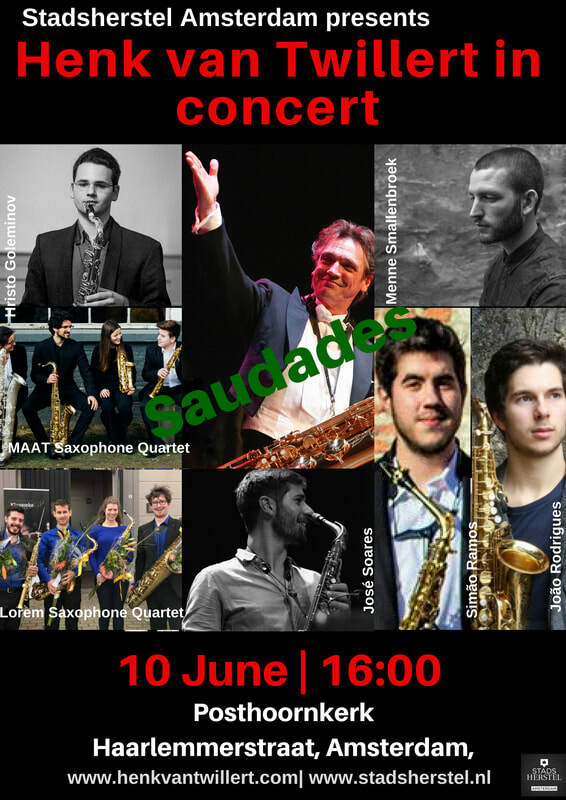 On stage will be portuguese and dutch Musicians that choose the Netherlands or Portugal to discover new ways to make music and the Feeling of "Saudades"
​After each concert there is an opportunity to chat with the artists while enjoying a nice glass of wine. 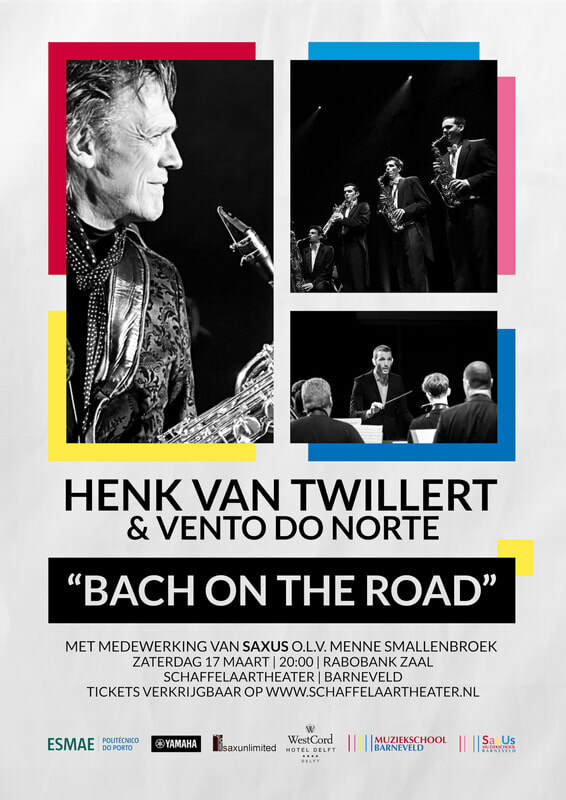 ​Henk van Twillert in Concert - "Stille Zaterdag"
The Solo Cello Suites from Johann Sebastian Bach on the baritone saxophone of Henk van Twillert followed by the yoga practise from Lies Schuring. 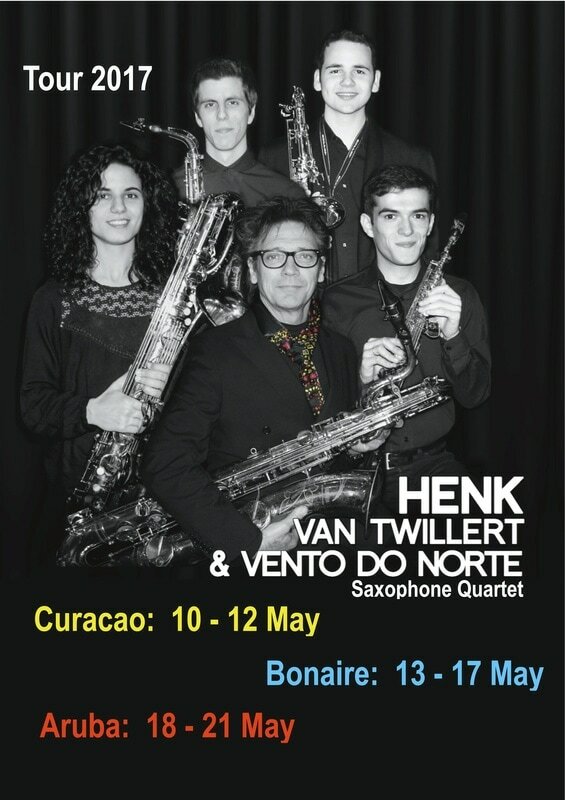 ​Henk van Twillert in Concert - "Once Upon a Time..."
From 12 to 18 March saxophonist Henk van Twillert and Vento do Norte saxophone ensemble will be touring in Holland. 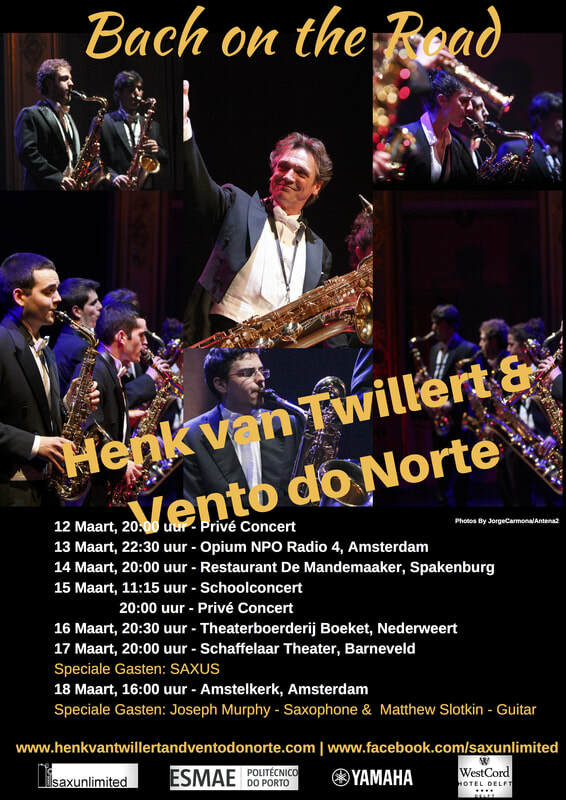 Beside private and school concerts they will be playing concerts open to everyone in Barneveld where saxophone orchestra SAXUS will join them, on the 17th March. 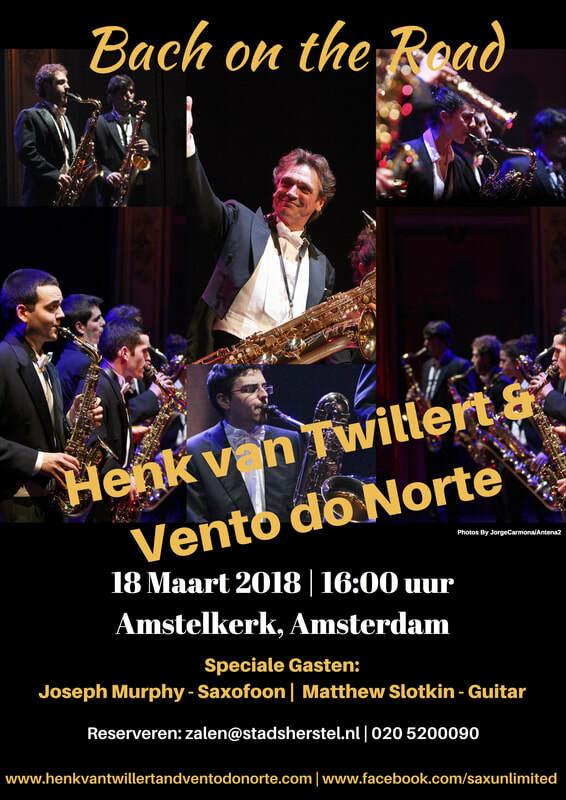 On 16th they will go south on the province of Limburg to perform in the Theaterboerderij Boeket in Nederweert and on the 18th of March they will be playing in Amsterdam, on the Amstelkerk. Make sure that you can be present in one of the concerts and bring some friends because it will be for sure a wonderful time! 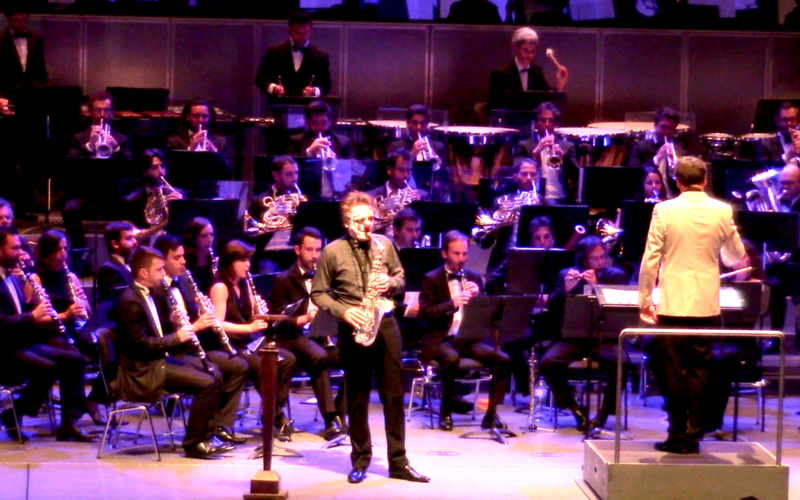 Henk van Twillert will join Banda Sinfónica Portuguesa to play Fellini from Johan de Meij. The conductor will be the composer himself, Johan de Meij. Henk van Twillert in Concert - "Vocalise"
As the title suggests this afternoon you will be all about the grand master Johann Sebastian Bach. That Bach is one of the greatest composers in the world, there is no doubt about, but did you know that he also has left his mark on several pop songs? Including the trumpet part of the song Penny Lane of The Beatles. 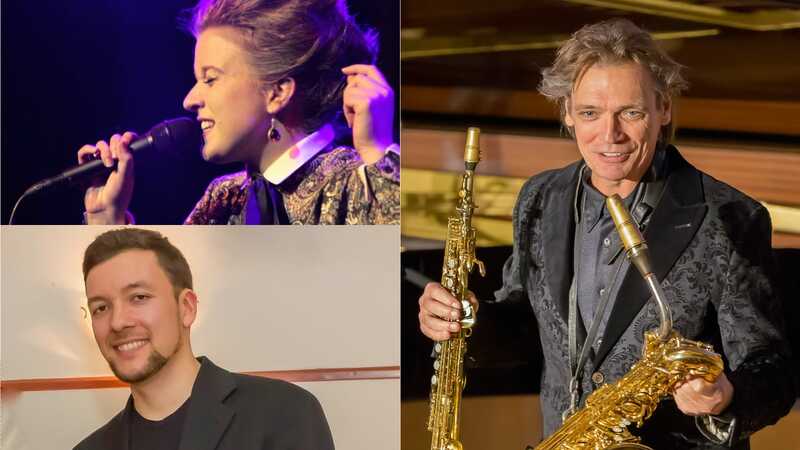 On the basis of musical examples, saxophone player Henk van Twillert and pianist Tjako van Schie will be playing a surprising “Koffieconcert” full of facts, compositions and stories about this famous composer! 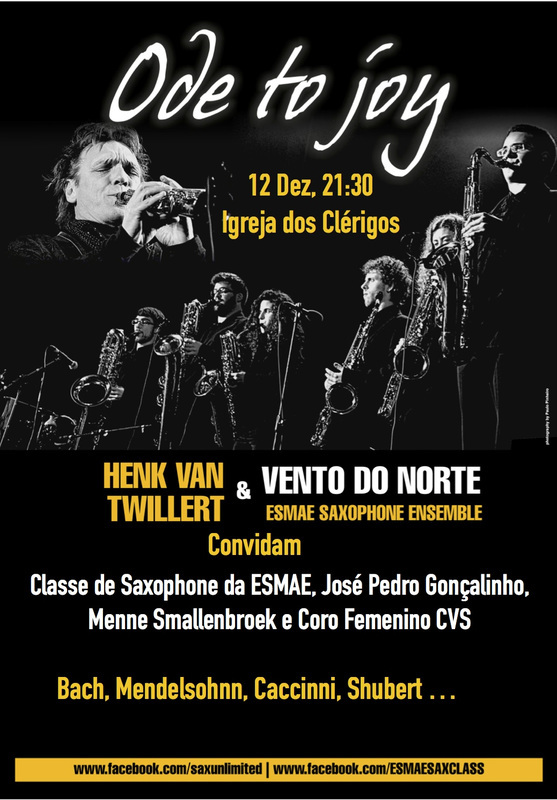 On the 12th December they will be sharing the stage with The Metropolitan String Quintet and Inês Soares. 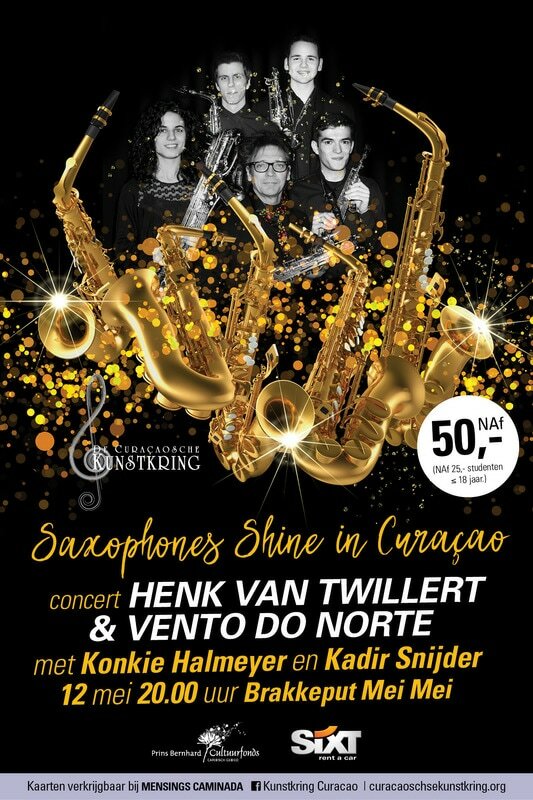 On stage with Banda Sinfónica Portuguesa to play a solo baritone saxophone concert with music from Chiel Meijering, the premiere in Holland of "One Punch Man". 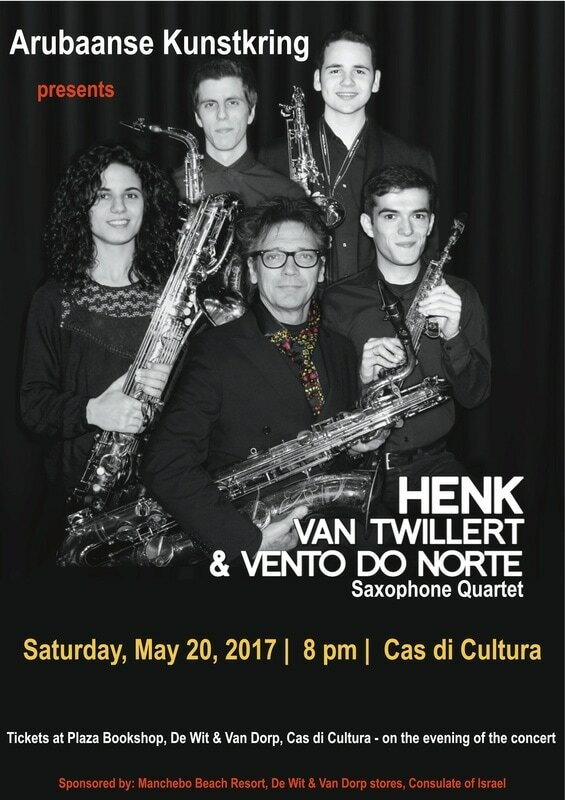 EURSAX 2017 - Very proud to be performing "Fellini" of Johan de Meij on the alto saxophone with Banda Sinfónica Portuguesa. Also o stage will other colleagues and former students. 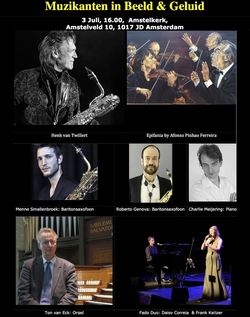 It will be a memorable evening and in the first raw will be the composer Johan de Meij, and for sure others. 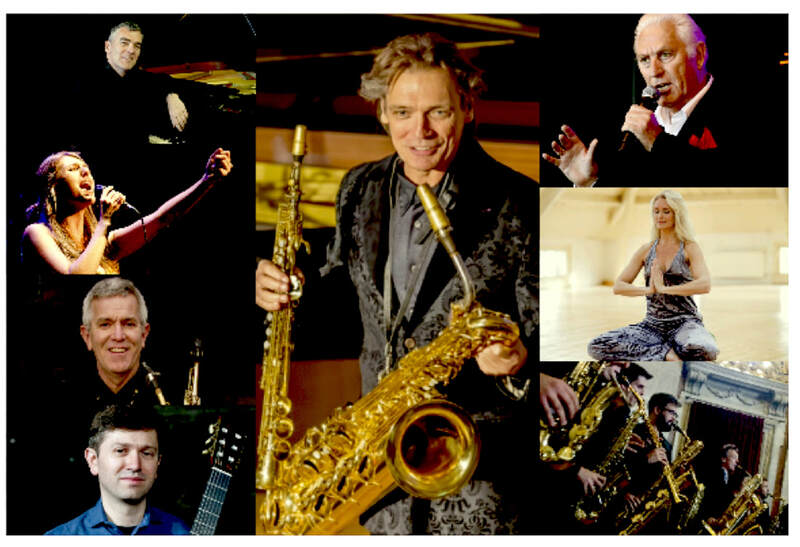 From 11th to 14th July it will be all about saxophone in Porto, Eur Sax17 - The biggest saxophone event in Europe. 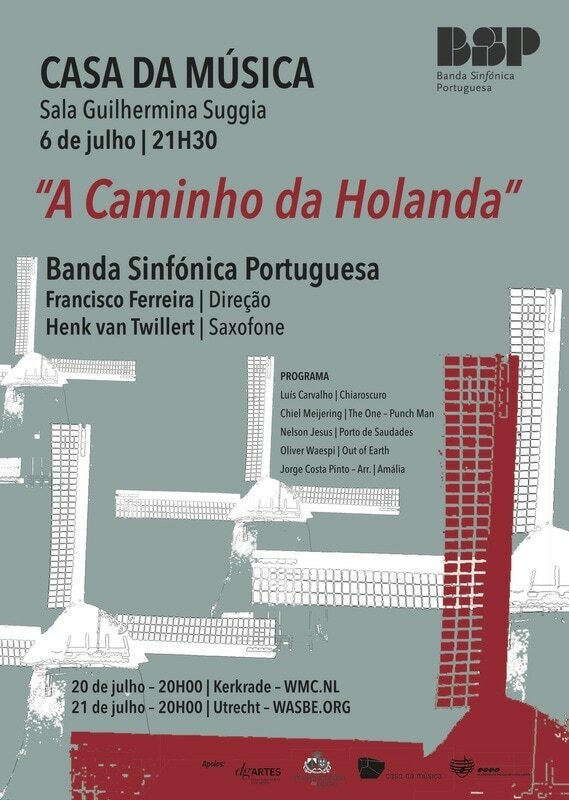 ​ ​Very happy and looking forward to be playing with Banda Sinfónica Portuguesa, conducted by Francisco Ferreira the world premiere from “The One - Punch Man” of Chiel Meijering for Symphonic wind Band and Baritone Saxophone. Also very proud that in the composer in joining us on the day of the concert. 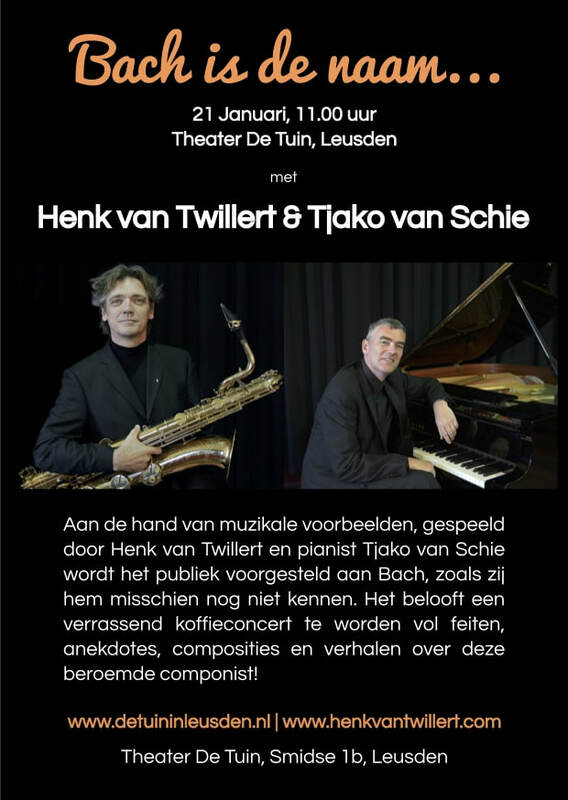 *Due to a fall in which Tjako Van Schie fractured his leg, Dutch pianist Paul Tijink will be joying me in the concert. 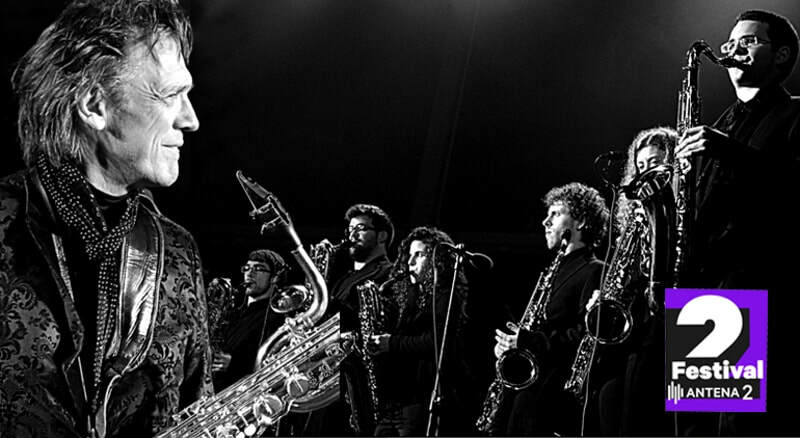 Workshop "Baritones on the Move"
​A workshop to discover, develop and enjoy the baritone saxophone by Henk van Twillert. A program based on one of the pillars of the string quartet repertoire: The Death and the Maiden from Franz Schubert, combined with one of the widely regarded best orchestral compositions of the Baroque era; Johann Sebastian Bach's second Brandenburg Concert BWV 1047. Surrounded by compositions of Arvo Pärt, Marc Mellits and Gijs van Dijk. On stage Henk van Twillert, Daisy Correia & Frank Keijzer, Menne Smallenbroek, Roberto Genova, Charlie Meijering and Ton van Eck for a afternoon of Music with composers such us Chiel Meijering, Gijs van Dijk, Loek Dikker and Johann Sebastian Bach. Will asso take place the opening of the exposition from the portuguese painter Afonso Pinhão Ferreira.